We learned this week that foreign students are more than three times as likely to stay illegally in the country as nonimmigrants as a whole, and we heard several weeks ago that the Department of Homeland Security was — after a gap of 14 years — finally thinking about raising the DHS fees for foreign students. The two announcements were not, as they might have been, linked by the government. In its annual overstay report, the publication of which is to be commended, DHS said that 1.33 percent of all those who arrived with visas at a port of entry in 2017 overstayed, and thus fell into illegal status. DHS sorted out five subpopulations for analysis and the one with the highest level of illegal presence consisted of former foreign students. Their illegal stay rate was 4.15 percent. Last month, the Department of Homeland Security proposed — for the first time in 14 years — to increase its fee for newly arrived foreign students by $150. It will be $350 per student, up from $200. DHS also proposed that new certifications for institutions wanting foreign students would be raised from a ridiculously low $1,700 to a still unrealistic $3,000. My sense is that those of us interested in keeping the levels of illegal immigration down to a dull roar should all email (or write) to DHS suggesting that these fee increases are both long overdue and insufficient. The fees should be raised still further, and immediately. The suggested letter-writing, described further below, is intended to partially balance the avalanche of mail that Big Education is sure to stir up, taking the opposite position, as well as the volumes of correspondence that will flood in from potential students in India and China, our largest sources of foreign students. The publicly reported profit, in a recent year, from one rogue educational institution, a single visa mill in California. Which of those two numbers is the larger? The reader's immediate reaction might be: "Well, there must be hundreds of thousands of new foreign students a year, so the government will be getting much more money than the profits of a single visa mill, right?" Let's do the math. According to the Migration Policy Institute, there were 291,000 new international students in the 2016-2017 school year. Multiply that by $150 and you get $43,650,000. But the $43,650,000 is overshadowed by the profits of a single, highly controversial visa mill, Northwestern Polytechnic University in Fremont, Calif. NPU has a 99 percent or so foreign student population, more than 90 percent of its income comes from their tuition payments, and its profit margin in 2016 was $53,623,279. This was not a fluke. In 2015 its profit margin was almost exactly the same, $53,529,081. These numbers are drawn from the annual reports filed by non-profits, the IRS Form 990; those of NPU can be seen here. Maybe some arm of the government is examining whether NPU should be getting all the tax breaks that come with the 501(c)(3) status that it currently enjoys, and maybe not. Visa mills are marginal, post-high-school educational institutions that provide little in the way of education, but do create legal status in the United States for aliens who are not likely to be able to obtain such status otherwise. These visa mills let their alien "students" work legally in the United States under programs where their employers are rewarded with a tax break under the Optional Practical Training Program. 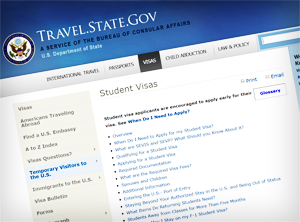 Most foreign students do not attend visa mills, of course, and over the years it has been helpful to this country that many of them have benefited from their U.S. educations, and hopefully they have a generally positive view of the United States. A few foreign graduates have gone on to be political leaders in their home countries. But there are two troublesome minorities in this scene, the visa mills among the institutions, and the overstayers among the students (and alumni). It should be noted that overstayed foreign students are much less visible than aliens seeking to cross the Rio Grande and much more expensive to locate and remove, though both are here in equally illegal status. So it makes sense to raise more funds from fees to seek to manage this population. The agency handling foreign students, the Student and Exchange Visitor Program (SEVP), an arm of DHS's Immigration and Customs Enforcement (ICE) is, unusually, funded by fees, not tax funds. My sense is that we may be at a point in time in which both additional funds and new agency leadership can together attack these problems in a way that the DHS has not done in the past, as I have noted from time to time. There are new leaders of both ICE and SEVP. On Monday, President Trump nominated career law enforcement official Ronald Vitiello to become the ICE director; he currently holds the position on an acting basis and his nomination is subject to Senate approval. A couple of layers deeper into the system is the office of the deputy assistant director in charge of SEVP. The new boss, a career DHS employee in a career position, is Rachel Canty; she succeeds another career official, a retired Coast Guard captain. On his watch SEVP seemed to lack any real interest in closing the visa mills. Maybe new leaders with new resources will make a difference. Readers interested in this proposal are encouraged to write to DHS expressing their support for even higher fees than SEVP has suggested. The deadline for these comments in September 17. The page for comments on this regulation is here. To send comments by postal mail instead, address them to Sharon Snyder, Unit Chief, Student and Exchange Visitor Program, U.S. Immigration and Customs Enforcement, Department of Homeland Security, 500 12th Street SW, Washington, DC 20536. Make sure to note Docket No. ICEB-2017-0003.